Before recycling a plastic container that once held food, get the container as clean and dry as possible. Containers that hold recycling contaminants like food are often separated out and sent to a landfill. When recycling plastic water bottles or plastic containers with colorful caps, leave the cap on. While caps used to be difficult to separate from bottles, recycling locations have advanced, and it is much easier now to recycle the whole bottle at once. Find out more. Keep plastics containing food or drink out of the dishwasher or other hot places, like your car. The warmer plastic gets, the more it tends to break down, melt and release chemicals. 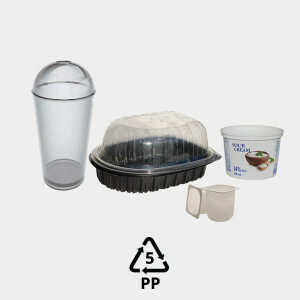 Send your plastic #5 containers to the Preserve® Gimme 5 Recycling Program, which accepts plastic #5 at various drop box locations as well as by mail. See a list of the products they accept here. Plastic #5 can be recycled into battery cables and cases, brooms, brushes, bicycle racks and ice scrapers.